Please join us for a celebration of freethinking on Saturday, July 25, 2015 at Coonskin Park in Charleston, WV. The event will be jointly hosted by us, the Charleston Secular Humanist Community Center (Charleston SHCC), and the Morgantown Atheists. 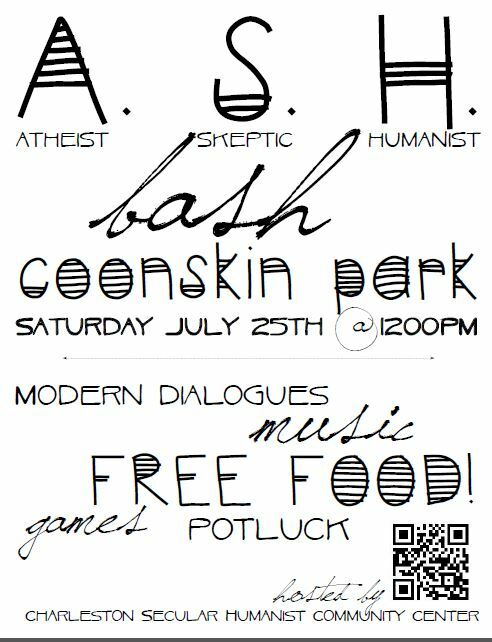 In continuation of the Morgantown Atheists’ annual tradition, the event is called A.S.H. Bash III. “A.S.H.” stands for “Atheists, Skeptics, and Humanists.” But everyone is welcome, unconditionally! As you’ll see on our schedule below, we will have food, games, music, a speaker, a moderated discussion, and other entertainments, beginning at noon and lasting till around six p.m., at which time we will head over to Plaza Maya (Mexican restaurant) in Kanawha City for the “A.S.H. Bash After Hours” hangout, which will be officially hosted by the Kanawha Valley Atheists and Agnostics. You will be welcome to stay for as much or as little of the day’s events as you wish, of course! Just yourself is plenty, but we hope you will also bring friends and family! Calm and friendly pets are also welcome. In addition, we would appreciate it if you could bring a food item to share, as our lunch will be potluck-style. You may also want to bring a lawn chair, for more comfort than the picnic tables offer. As mentioned above, you are welcome to bring your musical instrument/s for the open mic time. One of our members is bringing a digital piano and a guitar that you can use if desired. But, again, it is fine to just come as you are! For those who don’t drive or don’t want to, we will provide a free shuttle service to the park from the East End of Charleston. You can meet us at the parking lot of State Farm (Brett Kelly), beside McDonald’s—1614 Washington Street East. If you don’t see us and you have a cell phone, call Jason Loveless at (850) 206-5873. For those driving to the park, we will be at Shelter #1, which is across from the park entrance (but not very visible from the road). The parking lot for Shelter #1 is actually before the park gates, on the left side of the road. We will put up signs to help you! If you have any questions or if you would be willing to volunteer to help at the event, please contact us and let us know. Click here to view or print flyer as a pdf.